It's Hip 2 Serve! : New Printable Old El Paso Coupon means BIG Savings at the Commissary! New Printable Old El Paso Coupon means BIG Savings at the Commissary! Hurry and print this new coupon for $1.00 off on any 2 Old El Paso products IE, Firefox or Safari (excludes Old El Paso refrigerated, frozen or soup products). 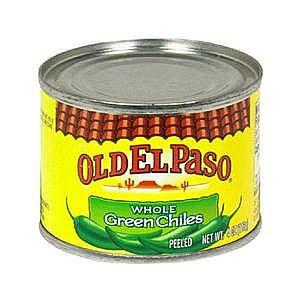 There are currently many Old El Paso products for sale at the commissary (these sale prices many only be good through today?!). Old El Paso Mexican Seasoning Mix 1 oz. is currently priced at $0.50 so the coupon will make these FREE. Yeah! Old El Paso Refried Beans 16 oz. are currently priced at $0.85 so the coupon will make these only $0.35 each! Old El Paso Heat N Serve Mexican Black Beans 8 oz./Heat N Serve Rice 8.2 oz. currently priced at $0.99 but only $0.49 with the coupon! Old El Paso Whole Green Chile Peppers/Chopped Green Chiles 4 oz. are $0.75 but the coupon will only make them $0.25 each! To see all the current commissary sale items including even more Old El Paso items, click here.